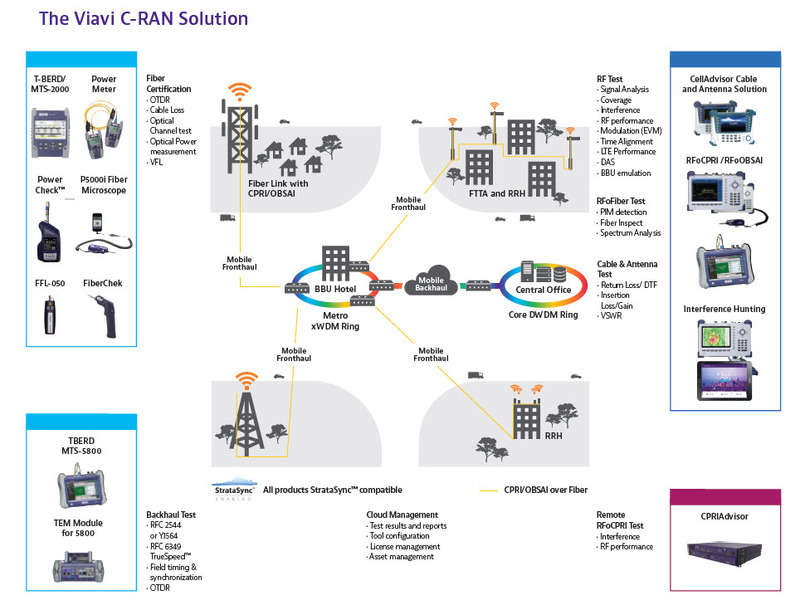 Centralized Radio Access Network (C-RAN) deployment is a growing trend in the wireless industry. I am often asked what is driving this trend, why some operators are using it more than others, and what are some of the challenges and benefits of C-RAN. In this blog, I will try to capture some of those questions and what comes next after C-RAN. The simple answer to what is driving C-RAN deployment is “technology”. Let me elaborate. Distributed radio architecture allows the digital component (AKA the BBU) to be installed away from the remote radios heads (RRH) via a fiber link. Generally, the protocol used to connect the two is Common Public Radio Interface (CPRI) or open base station architecture initiative (OBSAI), where RF information is digitized over the fiber link. In C-RAN, hundreds of remote RRHs can be distributed across the network to connect to a centralized BBU pool. This configuration not only offers CAPEX and OPEX savings, but it also helps improve RF performance and network scalability. The key performance advantage of C-RAN is that it allows service providers to take full advantage of cell coordination schemes offered in LTE-Advanced. For example, the Coordinated Multipoint (CoMP) feature requires close coordination between several geographically separated eNode-Bs (eNBs). eNBs dynamically coordinate to provide joint scheduling and transmissions as well as providing joint processing of the received signals. In this way, User Equipment (UE) at the edge of a cell can be served by two or more eNBs to improve signal reception / transmission and increase throughput particularly under cell edge conditions. Having BBUs co-located in a C-RAN architecture reduces latency, which is an essential requirement for cell coordination schemes. While C-RAN delivers significant benefits, deployment of C-RAN also offers some challenges that might help explain why we see certain service providers leading C-RAN deployments. What is obvious is the need to have access to fiber from the BBU hub location to the remote radios; hence, service providers with cost efficient fiber fronthaul are more likely to deploy C-RAN. To meet the need to transmit significant amounts of data in 10-Gb/s range on the fronthaul, service providers have widely adopted wavelength division multiplexing (WDM) to make a more efficient use of the fiber plant. With WDM, each RRH on the tower requires an optical interface at a different wavelength, which can then be combined and transmitted efficiently over a single fiber to the BBU hub. The corresponding BBUs each require a matching wavelength interface and need to be carefully cabled and tested in both directions to avoid misconnections. The choice of CWDM vs. DWDM will depend on the required capacity and the cost of deployment. Using Viavi’s T-BERD/MTS 2000, technicians can quickly and efficiently validate CWDM or DWDM fiber installations. In addition to fiber fronthaul capacity, not meeting acceptable performance metrics for latency, jitter, and synchronization for the fiber fronthaul can cause poor signal quality at the edge of cells, location based services inaccuracy, high dropped calls, service degradation, and spectral inefficiencies. Another challenge is the accessibility to RF information. Since all RF functions reside at the RRH, any RF maintenance or troubleshooting such as interference analysis requires access to the spatially distributed remote radio heads located near the antenna. RFoCPRI test solutions like CPRIAdvisor allow service providers to remotely monitor RF information at the BBU hub for up to 576 fiber ports, which can bring significant OPEX efficiency. As the wireless industry moves toward 5G, service providers need to become more agile in terms of service offering, while reducing their network CAPEX investment so they can offer new services in a cost-effective and time-sensitive manner. Virtualizing network functions by leveraging software defined networking (SDN) and network function virtualization (NFV) will allow service providers to break away from costly and time-consuming network upgrades. It is expected that radio access technology will follow the same direction, where BBU function can be virtualized into a cloud-based radio access network (Cloud-RAN), with a similar but more advanced architecture than centralized RAN. This network revolution will drive cost and network efficiencies, and will offer service providers the flexibility and agility to be competitive with over-the-top services. Testing C-RAN is a little bit more involved when compared to macrocells. In addition to certifying all the cables, connectors, and other active and passive components, cell-site installers are required to validate new WDM routes as well. Viavi has been working closely with mobile service providers to provide comprehensive test solutions for installing, commissioning, and maintaining C-RANs. Our solutions are designed to streamline workflows and simplify operations with centralized inventory and test equipment management, and consistent presentation of results. To learn more about the role of CPRI in C-RAN architecture, download our latest white paper.